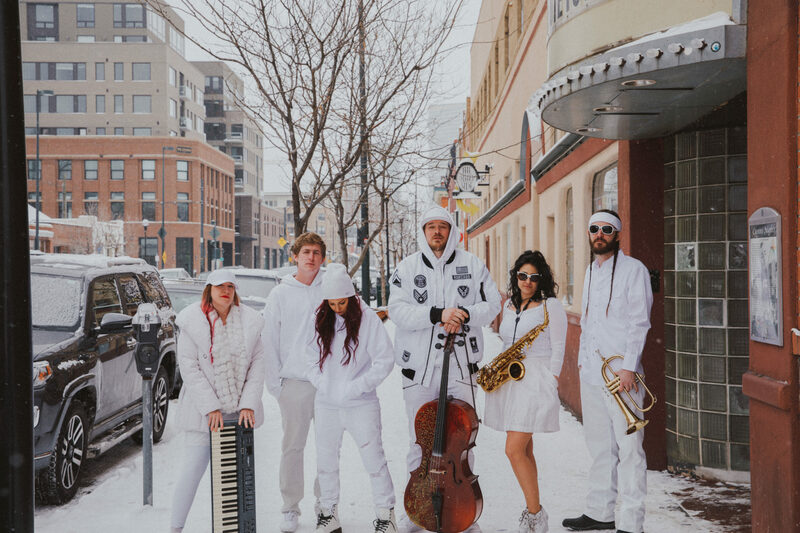 Newly formed Colorado supergroup Animated Earth is an all-star team of seasoned artists from Denver’s musical realm. The project is the brainchild of Cervantes Re:Search Wednesday resident and Whiskey Blanket member Jordan Polovina. 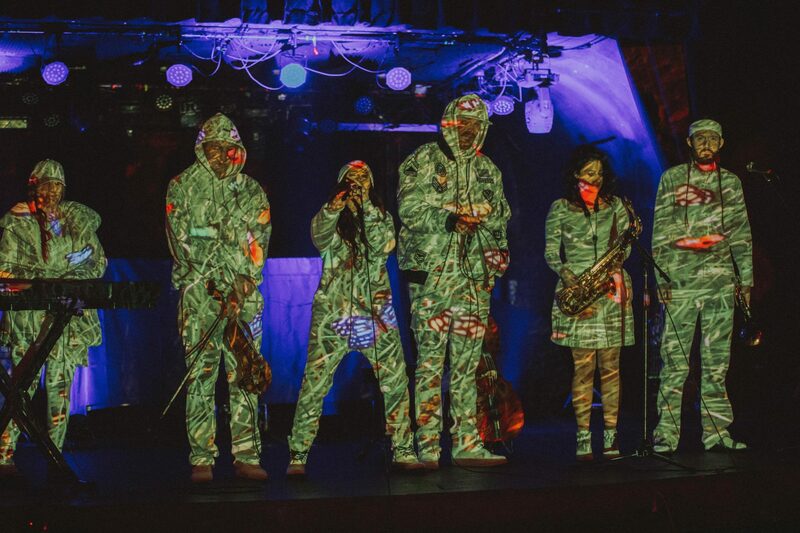 The group is composed of Polovina on cello/vocals, Sam Goodman on the violin/live sampling, Sarah Mount on the saxophone, Emma Badman on the keys, Jessa Raskin on guitar/vocals, and Paul Maley on the trumpet. Track production is handled by Goodman and Polovina, while the writing process is collaborative and incorporates input from everyone in the group. Snag tickets to their upcoming show at Cervantes here! Each artist brings a fresh perspective to the project based on their background in music. Polovina and Maley pull from roots in hip-hop and classical/jazz music while Raskin and Goodman mashup folk with rap features and elements of electronic music in their duo m i n o r. Badman has experience DJing hip-hop and electronic shows with her group Sassfactory and Mount plays in enough projects to fill a festival lineup with genres including reggae, jazz, hip-hop, electrosoul, and more as well as leading her own improvisational jam collection, Sarah Mount and the Rushmores. The summation of the talents within Animated Earth is exemplified on their debut single “Who I Am”. Talking with the AE team made it obvious that everyone has a role to play. We had the chance to sit down with them before their upcoming show at Cervantes on Wednesday April 17th. Hey guys, thanks for taking the time to talk today. To start, connect the dots of your guys’ history playing music together. Polovina: We’ve been making music separately and together for a long time. Emma and I were in a band together, Jessa and I were in a band together, Sam and I played in bands together, Paul is in my band Whiskey Blanket. We’ve just all played in each others bands for a really long time. We all started playing music together recently as this group (Animated Earth). But we’ve been playing together for years now. Time flies, it’s been a long time. Raskin: Years, we all definitely knew each other before this group came together. Badman: Yeah, I think it was around 2012 when Jordan and I started playing together. Raskin: And Grim&Darling started in 2014, and Sam was in that with us. Mount: I was introduced to Emma and Sassfactory through Jordan, who I’ve played with since 2015 in Grim&Darling and the Whiskey Blanket Live Band. Polovina: And I’ve been in Whiskey Blanket forever. Paul when did you join Whiskey Blanket? Maley: It was around 2015; I was on like two tracks on From the Dead of Dark, and then for Thick as Thieves it was like here’s six songs you should be on, and actually here’s three more. Polovina: Basically we’ve all played music together, I saw everyone and we had never played as this setup and it made a lot of sense to me with the horns, strings, piano and all the classical elements, Sam is a huge factor on the production side of things, so all those things working together is pretty awesome. So how are you approaching this project differently compared to past projects you’ve worked on? Raskin: I think it’s kind of a challenge to make it different to the things we’ve done in the past. Badman: Just getting everyone together can even be a challenge. Raskin: It’s kinda like Grim&Darling and m i n o r with other things mixed together. Polovina: I think we’re going to be a little more selective with what we do. Typically in the groups I’ve been in we just do anything and everything all the time as far as shows and playing goes. But I think we’re going to try to make our shows a little more special and put some work into them and some production and some love. That’s a little different – usually we just go gig. Goodman: I feel like with every band I’ve been in this size has kinda gotten thrown together at the last minute. The fact that we get to write together and people are coming with parts that are actually contributing, and we can go back to production and change s***. It’s not just writing parts on top of music that already exists. Raskin: It’s definitely collaborative all the way. It’s not just one person’s vision and everyone adding to it – everyone is bringing big parts to it which is cool. Maley: It’s crafted in the show. Actually crafting what people are going to see, and planning on how we’re going to deliver it. It’s more than than just learning some tunes and play them. Polovina: It’s going to be its own thing…an original theatrical project. Raskin: It’s way more of a cultivated experience that we’re trying to conceptualize, rather than let’s just play this music and put on a show. Tell me why “Who Am I” was selected as the first single you guys chose to release? Polovina: I thought it was just the dopest production we had in the folder and it’s really lively so I just started writing to it. Raskin: It has the whole part in the middle that showcases everyone so it’s kinda like a business card. With all the different instruments and styles within the group, how does the creative process work among you guys? Raskin: It’s so collaborative; everything is so open ended. If Paul writes an amazing horn section, we’re just like alright now that’s a horn section and all write around it. Polovina: It’s happened really naturally. Polovina: I think that all the production we threw in the hat was pretty simple – they were ideas as opposed to full songs that we were wanting to write over. It was really easy for him to format stuff and like Sam said, Paul writes some great stuff at home. Goodman: Yeah, when we first got together Jordan put together a list of ten songs that just weren’t finished or things he wanted to reimagine and I had like thousands of songs that never had turned into anything so we just sat around for a couple hours and voted on tracks and decided what we wanted to do. Nothing was finished, like the “Who Am I” track had no instruments or vocal parts. We all purposely picked things that had some room. Any gameplan for more releases? Polovina: As far as releasing music – What I’ve noticed is things kinda reveal themselves. If a song is really nice and we enjoy it and people enjoy it then we’ll work on releasing it. Goodman: And this is so live – it’s different than electronic music and just acoustic instruments – there’s a reason we didn’t just release that song. We tried to give people a taste of what it’s gonna look like but even still that didn’t do it justice of what it’s going to be like on stage. Maley: I’m excited that we’re crafting something specific. There are only certain places, it’s not like we can just pick a venue and play it. The setting has to be right. It’s just crafting something that we really enjoy and are proud of and is really organized and set. It’s kinda cool for me for that reason. Mount: It’s been nothing but fun, easy and smooth working with these amazing people. Raskin: I just really love everyone in this group! Polovina: I think there’s huge potential in this group just generally. I think there are some really strong thinkers and talented musicians. We’re just riding the train; opportunities will or won’t arise but we’ll take on whatever is in front of us. I’m really excited and I definitely have more ideas that maybe in the future could provide for us. Can’t wait to see where this goes. Animated Earth is debuting their live set on Wednesday, April 17th at Cervantes Other Side. Snag tickets here!